GENESIS.gedmatch.com is a free 3rd party site of tools where you can upload your DNA test results and compare them with those from people who have tested at other companies. It is the new version of GEDmatch.com that can compare the data from many more companies than the original. 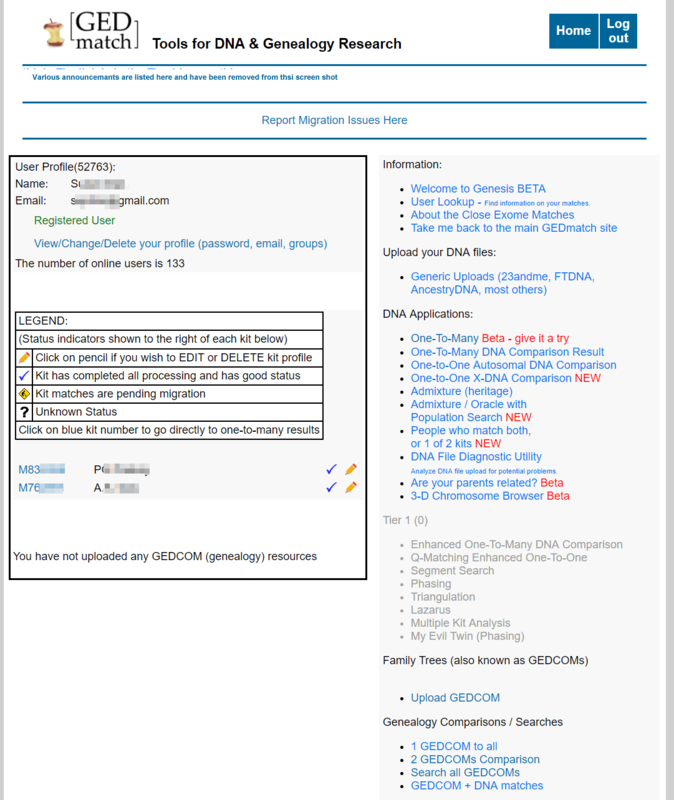 Click here for my previous post written for GEDmatch users moving to GENESIS. Today’s article is to introduce GENESIS basics to the new tester. One problem for many users is that this site is not intuitive. GENESIS does not hold your hand and does not build your tree for you. You have to learn how to use the tools there to the best advantage for your own research. I have many posts on this blog for GEDmatch, most of them are also useful for Genesis and I will list some of those later. UPDATE 17 FEB 2019: Click here for the slides from my presentation about the basics of using this site from Saturday Feb 16, 2019, in Carlsbad for the North County DNA Interest Group (DIG). To get started at GENESIS, you have to be registered as a user. Currently that is still done over on the old GEDmatch.com site. Your login will be your email address with a password you create. Some people prefer to use an email which they have created just for genealogical research. Easy to do at gmail, hotmail, or yahoo, among others and it is a way to create some privacy. Note that GEDmatch is careful to warn you when you register that their site can be used by law enforcement to try to identify violent offenders and victims. Click here to understand how your DNA can out a distant cousin who is a criminal. Before you can use GENESIS to explore your test results, you have to download your DNA data from your testing company. Click here for the help page that GEDmatch provides on how to download your DNA. The file of your test results is quite large (about 700,000 lines of data) and zipped. DO NOT UNZIP it. To upload your results to GENESIS you log in and then click on Generic Uploads (23andme, FTDNA, AncestryDNA, most others) in the right hand column under Upload your DNA files. That takes you to a form to fill out before doing the upload. You have to enter the name your kit was registered under, but you can choose to use a pseudonym to appear on Genesis. Put it in the box for alias on this form. For example, all my cousins are called Kittys#CuzNN where the number sign is 1st, 2nd, or 3rd, and NN is their initials so that I know who they are! 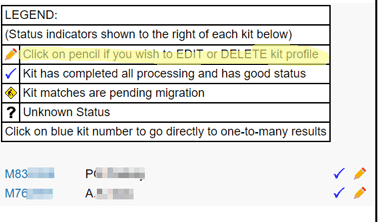 You have to change the No to a Yes after “You authorize this data to be made available for comparisons in the GEDmatch public database” if you want your results to be visible to your matches. If you want to stay private, then leave it as is for now, but change it after it is uploaded to “Research” so you can use all the tools on the site but stay invisible. Once your or your cousin’s file is uploaded, you are assigned a kit id (2 letters plus several digits) which will also always show on your home page when you log in. You need a kit id to use the tools. You can upload multiple tests and manage them all from this one user. You can make edits to any kit you own by clicking the pencil icon next to it on the left side of your home page. Click here for my presentation slide that shows you that edit screen and where to change the privacy to public or research or private. It usually takes a day or two to fully process your kit so that you can run the most important tool: the one-to-many. That is the tool that lists your DNA relatives in the Genesis database. While you wait you can experiment with the ethnicity tools (called admix here) covered in my Gedmatch basics post and in detail in these slides (click here). If some cousin, like me, asked you to upload and gave you their kit number, you can do a one to one compare with that kit before your kit is fully ready for the other tools. Click here for the slide that shows the form to make that comparison. There are slides following that one which have some examples. You can use all the defaults when you fill out the form with one exception: you may prefer to check the prevent hard breaks box at the bottom. That is particularly recommended for an X one to one. Personally I prefer to look at the image only comparison first, then I click back and select position only to get the numbers for each segment to put in my master spreadsheet. Once you see a blue check mark on the line with your kit number on your home page (as in image above), you can run the one to many tool. That looks at all the other kits in the database to find people whose DNA matches yours. The more cMs you share, the closer the match.